Comment	 The southern sky in the constellations Crux and Carina is filled with an entourage of impressive deep sky delights. In the image presented above, from left to right is IC2944 the Running Chicken Nebula, NGC3576 at center followed by the large nebula complex of NGC3372 more commonly known as the Eta Carina Nebula. Numerous star clusters also scatter the field. 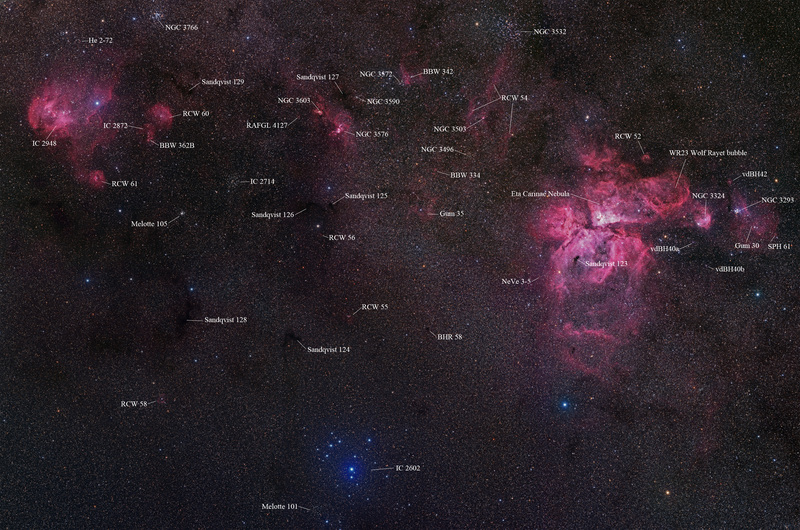 Wide field panoramas such as this, Eta Carina takes on the appearance of a Hibiscus flower. Lush petals produced by blue oxygen atoms dampening the vibrancy of the red hydrogen alpha atoms, both of which are divided by dark rifts of dusty nebulosity. Eta Carina spans a massive 120x120 arc minutes across the sky and resides approximately 10,000 light years away. Toward the bottom of the image is the open star cluster IC 2602, also known as the Theta Carinae Cluster or Southern Pleiades. The cluster is at a distance of about 479 light-years away from Earth and can be easily seen with the naked eye. Click here to view an annotated version of the image by Sakib Rasool. The image is a six panel RGB mosaic that includes Ha composites for added depth. The field of view spans 10.5 x 7.1 degrees.